On the Origin of Societies by Natural Selection, by Jonathan H. Turner and Alexandra Maryanski. Paradigm Publishers, 2009. Turner and Maryanski propose a Darwinian biological theory of the evolution of human nature from our origins as mammals, primates and apes; a Spencerian sociocultural theory of the evolution of human societies through hunting and gathering, horticultural, agrarian, industrial and post-industrial types; and see five effects of the former on the latter in our individualism, sense of self, propensity for mobility, sense of community and a system of hierarchy. The Theory of Cultural and Social Selection, by Walter G. Runciman. Cambridge University Press, 2009. Runciman proposes a general theory of human behavioural evolution which argues that collective human behaviour patterns are the outwardly observable expression of information affecting phenotypes transmitted at three separate but interacting levels of heritable variation and competitive selection – the biological, cultural and social. The Nature of Technology: What It Is and How It Evolves, by W. Brian Arthur. Free Press, 2009. Arthur proposes a general evolutionary theory of technology (defined as a device, method or process) which argues that all technologies are combinations of elements which are themselves technologies and which capture (natural) phenomena to some purpose. 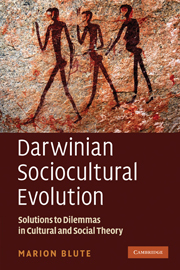 Darwinian Populations and Natural Selection, by Peter Godfrey-Smith. Oxford University Press, 2009. Godfrey-Smith’s book is a deep meditation by a philosopher on the foundations of evolutionary theory both verbal (in the text) and mathematical (in the appendix) which leads to a more general version of the famous Price equation. (See also Kerr & Godfrey-Smith, 2009). The last chapter applies these reflections and formulation to cultural evolution. Pattern and Process in Cultural Evolution, edited by Stephen Shennan. University of California Press, 2009. A long-in-coming eclectic collection of cultural evolutionary articles, mostly on archaeology, based on a conference held in the U.K. in 2005. Darwin’s Conjecture: The Search for General Principles of Social and Economic Evolution, by Geoffrey M. Hodgson and Thørbjorn Knudsen. Forthcoming, University of Chicago Press, 2010. Sociology: A Biosocial Introduction, by Rosemary L. Hopcroft, Paradigm Publishers, 2010. An introductory text in sociology which combines biological predispositions with more traditional sociological analysis.